blog.HalloweenAdventure.com | Latest News from the Costumes Trend FrontLines! 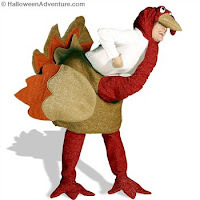 : Funny Turkey Costumes! Bawk, bawk. Bawk, bawk. That’s the sound of a turkey coming towards you! He wants to know why you never choose to dress up as him during Thanksgiving. He sees your Indian costumes and your Pilgrim outfits and he wonders why he never gets to be part of the fun. In his opinion, he’s the most important part! Satisfy your inner turkey with our funny turkey costumes. Our Turkey Thanksgiving Costume is full out animal with a body section with attached wings and tailpiece, all in shimmering orange, tan & brown fabric, a character hood attached to the turkey body with a long red shimmering fabric neck, and a pair of leg/shoe covers in the same shimmering red fabric. This baby isn’t meant to be served for dinner, and will cause an absolute riot at the holiday party. It’s also a great conversation piece when it comes to Thanksgiving dinner with those family members you just don’t mesh with. 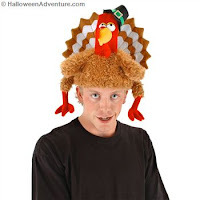 If you want something a little less crazy, try our Turkey Gobbler Hat. You put a turkey on your head! Say what? You’ve got a turkey on your head! Say what? This headpiece is so fabulous and will show the boss that you do have a sense of humor! With a tan furry hat wide brown and white wings, this turkey is realistic. With his red face, little feet, big eyes and little pilgrim hat, he’s made to party! Remember, if turkeys aren’t your style, we have other Thanksgiving costume options. You can check out our blog post on Indian costumes, or our posts on Pilgrim ones. For more Thanksgiving ideas, and for a daily recipe feature, check out our blog!